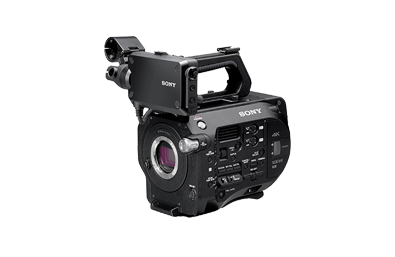 Sony FS7 Hire is available to hire from just £120/Day. Since being released this camera has practically wiped out the C300 market and stolen the show. At the price range it offers a huge range of features. The Sony PXW-FS7K is quickly becoming one of the most popular video cameras for everything from broadcast to documentaries to corporate videos to events. The ability to out of the box film in 4K, shoot slow motion up to 180fps, mount a variety of different lens types all in a lightweight ergonomic design, makes the FS7 the number one choice for your production. As standard, the FS7 package includes Sony’s all-round servo zoom lens (28-135mm f4) which is great if you’re after an ENG style camera with limited setup time on set. This quality powered zoom lens has been built to satisfy professional moviemaking requirements including high resolution 4K formats. Quiet operation is a priority so an SSM (Super Sonic wave Motor) drive system is used for quiet, precise zooming. Control rings allow you to zoom, focus and control the aperture which is the first time in this format of lens. If you want to utilise some faster glass, why not hire the Metabones Speedbooster EF to E mount converter to use your Canon EF glass on the Sony PXW-FS7 body. Sony FS7 Hire – Over Exposed LTD.